They Might Be Old, But They’re Still Cold! Learn about Re-Fridge. Mitch Newlin, a senior at Bates College in Lewiston, has created a novel business, Re-Fridge, based on efforts to prevent a wasteful practice he noticed as an underclassman. According to the company’s website they, “buy and sell used fridges for cash-strapped college students.” Newlin’s idea was simple. Instead of sending all of those still useable college dorm fridges to the dump, why not turn them around to be used by college students the next year? The logistics of this are the hurdle because of the storage requirements and the intervening summer months. Since Newlin purchased his first 52 fridges he has created a website which morphed to a mobile app, has expanded his business, hiring employees on college campuses in multiple locations, and has greatly increased the number of fridges diverted each year. Recently, according to The Forecaster, Newlin was approached by Goodwill Industries of Northern New England. Goodwill is now partnering with Re-Fridge to also find new homes for fridges that are donated to Goodwill but which the company does not resell. 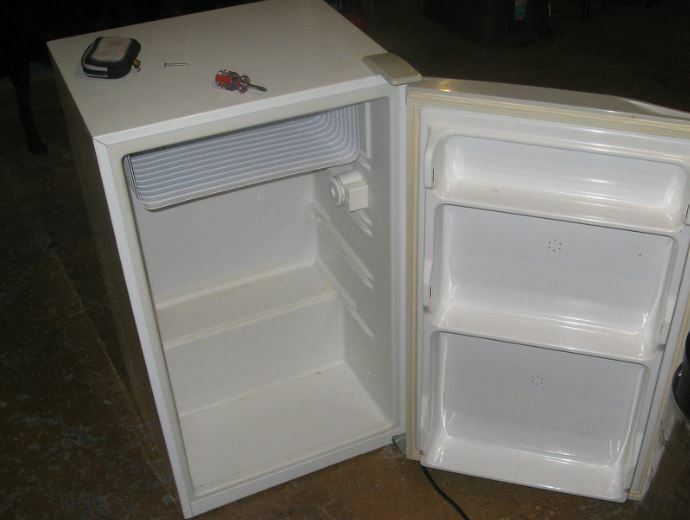 Re-Fridge checks every fridge for mechanical and electric defects to make sure they are safe before selling to a new round of college students. This is such an excellent idea which fits perfectly with Maine’s Solid Waste Hierarchy which puts a lot of focus on the reuse and recycling of products rather than simply chucking them into a landfill or incinerator, all while offering college students the potential to save money!